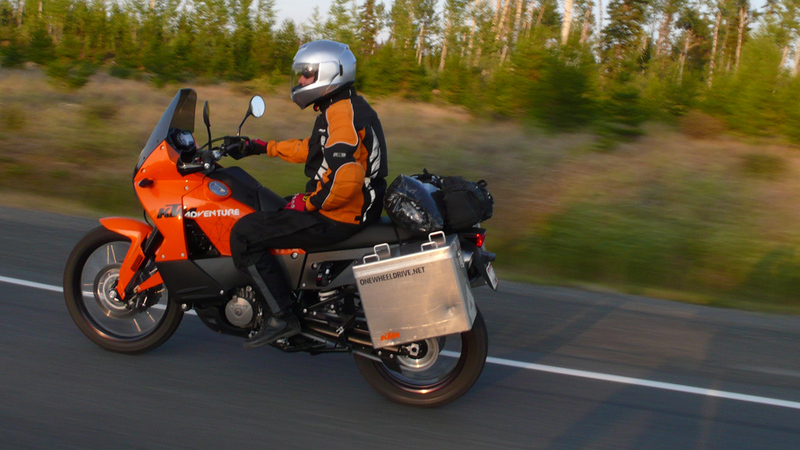 The 990 is plush compared to the F800GS, but Glenn found the backrest helped. 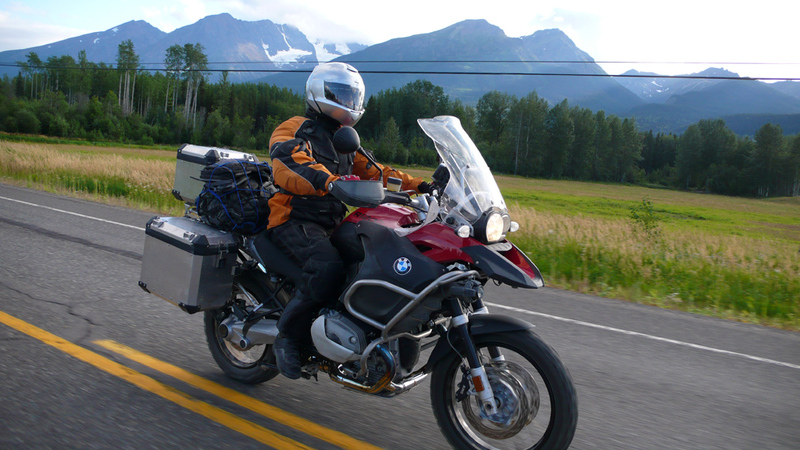 Three top-notch adventure bikes, the KTM 990 Adventure BMW R1200GS Adventure and BMW F800GS, spanning the higher wavelengths of adventure’s spectrums, light to heavy and moderately affordable to astronomical. 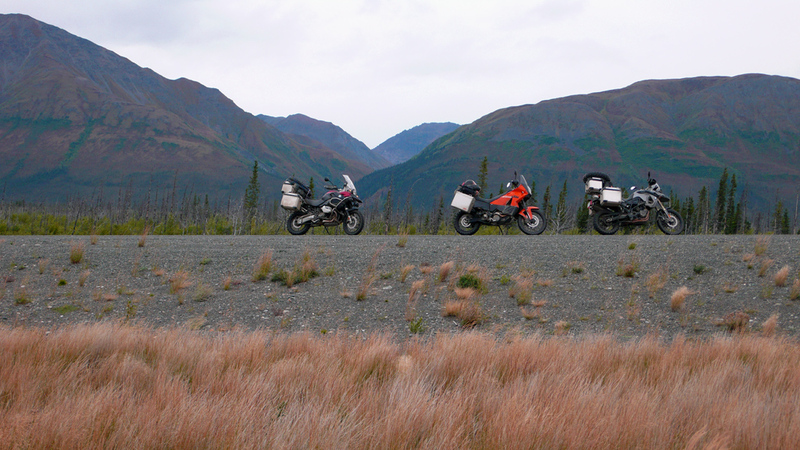 Still, it all comes down to this, the Dempster Highway. 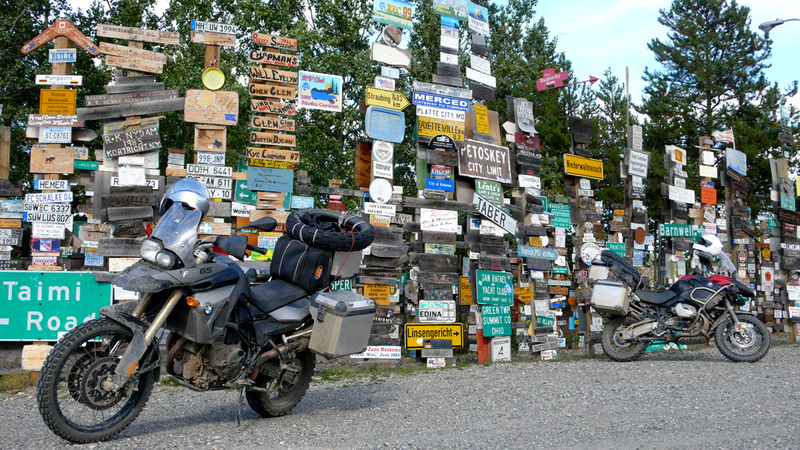 Seven hundred and thirty-six kilometers of dirt, clay, mud, shale and gravel, it’s the only all-season road in Canada to cross the Arctic Circle and go well beyond. 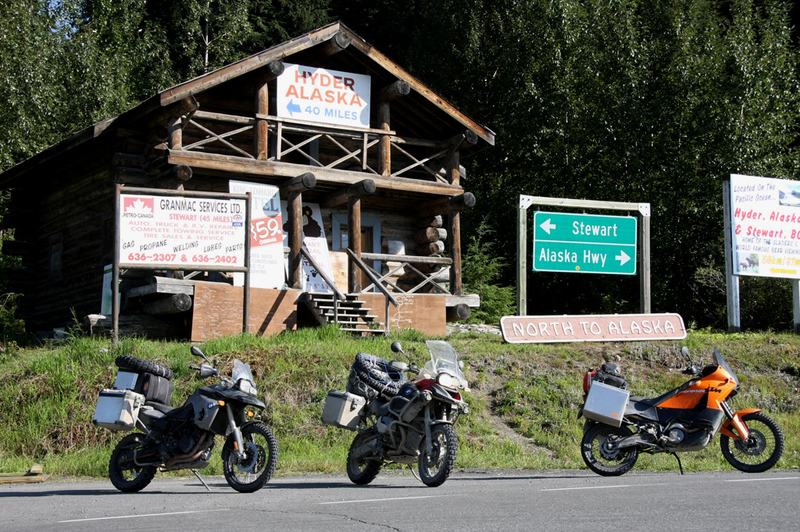 Calling this North America’s last adventure highway seems an under sell. Here you encounter corrosive calcium chloride used to hold the road together, tire slashing shale, mud so slick the locals call it black grease, potholes that will swallow half a front tire, ruts left by tractor trailers that will pull you around, gas so infrequent that planning ahead is mandatory, grizzlies the size VWs, washboard as harsh as any suspension test, weather as fickle as a titan and scenery so gorgeously impressionistic it would set Monet’s lower lip quivering. 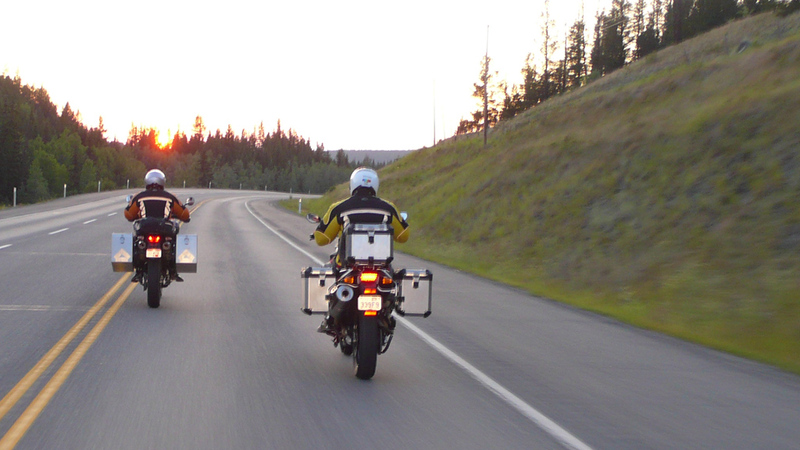 The Dempster is all the North’s motorcycle challenges and romance rolled up into one easily provoked and angry package. If you’re lucky you’ll catch it on a good day. If you’re not, you’re us. 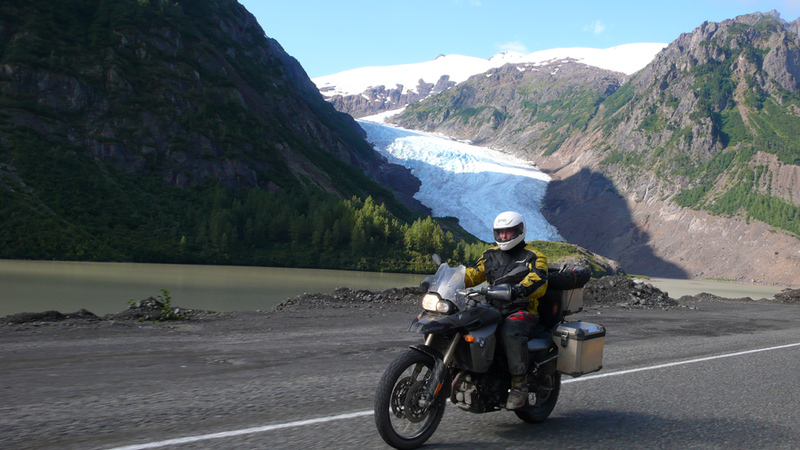 Simple, if you’re testing adventure bikes, you need a proper adventure. 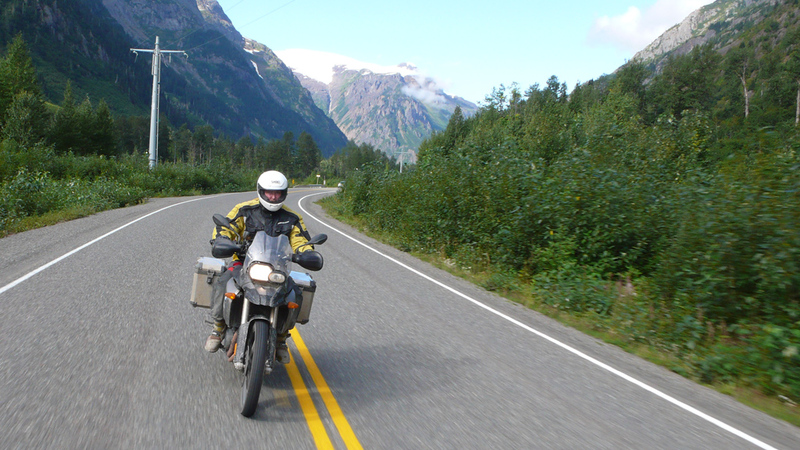 A week of homogenous weather on California’s back roads won’t cut it. 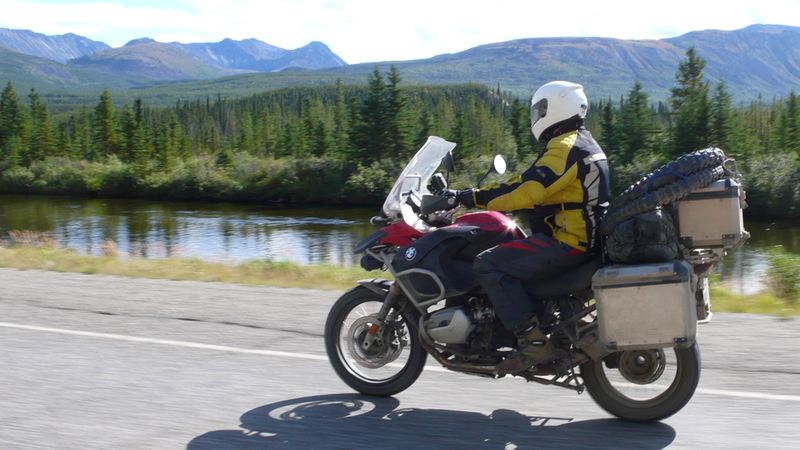 Riding 12,000km, 20% of that being unpaved, from Vancouver to Inuvik followed by a dash through Alaska will. It’s not gnarly single-track, because these are the “big” adventure bikes, the ones people look to when taking on the world with “second star to the left, straight on till morning” mindset. They’re also the ones we receive the most “please help me decide between” e-mails about. Mud, and its progenitor rain, tests luggage for water-proofing. Dead simple, the 41L Touratech Zega aluminum boxes we slapped on the 990 Adventure (saving KTM’s own luggage), stayed water tight, mud tight, and operable thoughout the ride. Not so much BMW’s cases, out of the six (two top cases, four sidebags) only one remained waterproof, so it would have been muddy underoos all round if we’d trusted the watertight marketing. The problem is that mud gets onto the seals around the rim of the bags spoiling them; so continual proper cleaning is required. The one bag that did remain watertight however was extremely so, we needed to pry it open with a screwdriver to break the vacuum seal after a decrease in altitude. The other problem encountered with the BMW luggage is the latching mechanism. Complex, these gum up with mud, unlike the simpler Touratech bags. The locks also gummed up, especially on the F800GS’s sidebags, which came with easily lost or forgotten inserts for the keyholes. 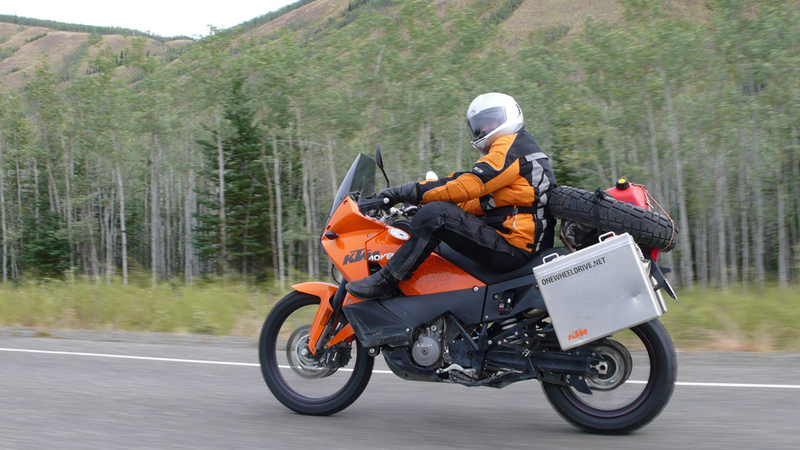 Of the three bikes, only the F800GS and KTM 990 Adventure’s luggage was “drop tested” thanks to soft shoulders and oversight on our part. All the luggage took the hit well, supported the bikes and minimized the damage… making the hard cases mighty expensive frame sliders. So we’re on the long ride, where comfort, consumables, fuel consumption, range, wear, corrosion, and design considerations, become hugely important, and problems go from a grain of sand in the shoe irritants to end of the marathon excruciating. Need examples? If we seem preoccupied with mud, it’s because we’d angered the weather gods and had a lot of it – over 30 days of riding only two required sunscreen. Nor are the spirits of navigation being kind, as British Columbia is ablaze forcing us to detour around wildfires as we go. Finally, luckily, we’ve angered the bike gods creating a three-way comparison of pure happenstance. At the last minute KTM couldn’t provide a second 990 Adventure for the trip, and BMW stepped up with a replacement in the form of the F800GS, saving our soon to be wildfire fried bacon. Back in Vancouver, a million muddy curses ago, we received the three test bikes all within a few kms of 1500km on the clocks, but with greatly varying usage. 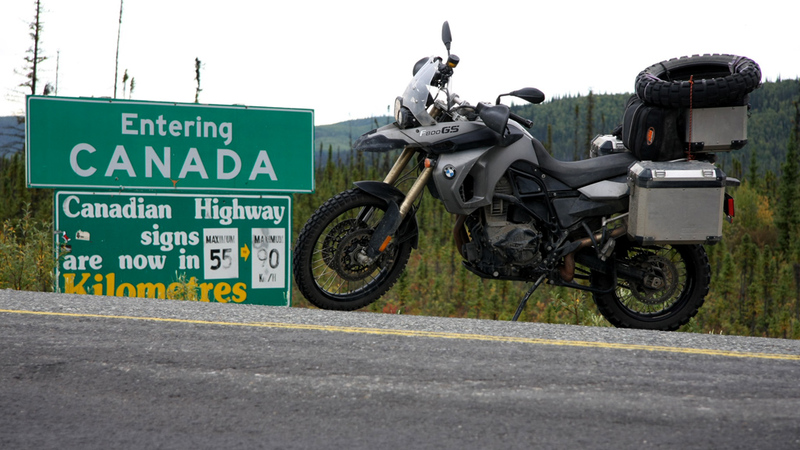 Our F800GS had been abducted from BMW’s off-road demo fleet, and been dropped repeatedly and received scratches, slightly bent off-center bars and a radiator freed from its mounts. The drop damage gives us the F800GS’s first fault; on a hard impact the fairing transmits the blow to the radiator breaking the mounts. In our F800GS’s case the radiator and fan shrouds pushed against the header to melt, making a strong case for drop guards. 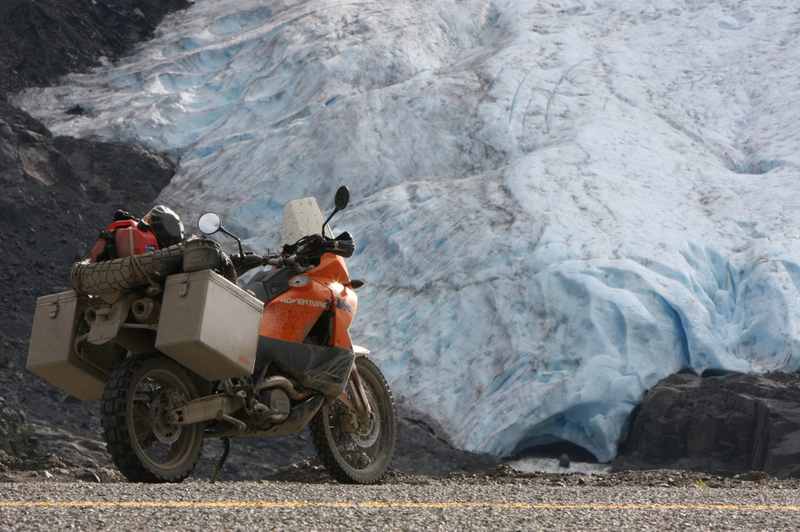 On the plus side, we’ve proven you can zip-tie one together and ride to the Arctic and back. In contrast the R1200GS Adventure and KTM 990 Adventure arrived pristine, which is a shame, because they’ll never be the same after the Dempster. 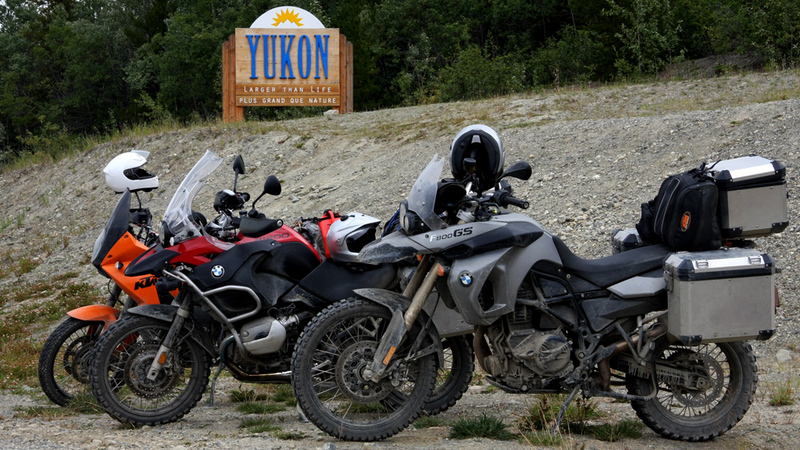 On reaching Whitehorse we put all the bikes on equal footing, swapping on Continental TCK80’s all round at Yukon Honda, before heading out on the final road leg to the Dempster.